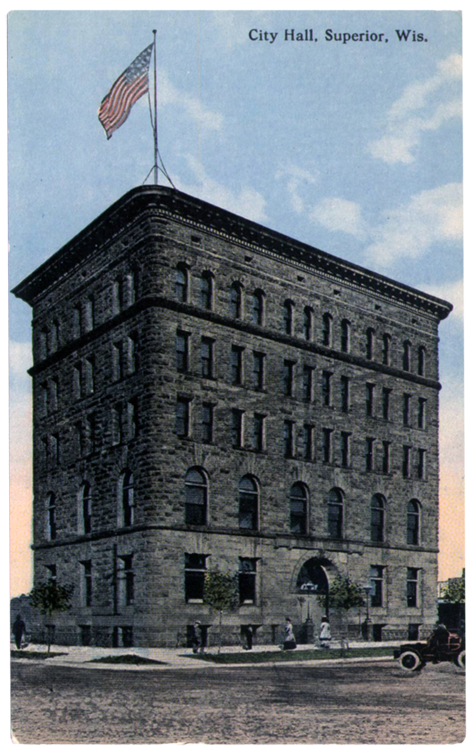 Originally built in 1890 as the Trade and Commerce Building, Superior’s old City Hall was the home of local government from 1904 until 1970. Architect Clarence Johnston (who also designed Glensheen, the Congdon estate in Duluth) had the building’s façade covered in “a local rock-faced brownstone ashlar” and intentionally rounded the building’s corners to dramatize the surfaces’ continuity. A police station was built along the north side of the building on Hammond Avenue. It is now home to the Red Mug coffee house and many local artists, many working in clay.